"Questioner: Tom Flaherty will be here this evening and will be helping in the evening session. Is this all right? "Questioner: I've been asked if it is possible for Tom Flaherty to attend one of these communication sessions tomorrow. Are you familiar with the entity, Tom Flaherty? Ra: I am Ra. This mind/body/spirit complex, sound vibration of "Tom Flaherty," is acceptable. We caution you to carefully instruct this entity in the frame of mind and various appurtenances which it must understand before it is conducted into the circle." "Questioner: I'm not quite sure what you meant by appurtenances. Ra: I was referring to the symbolic objects which trigger this instrument's distortions towards love/light. The placement and loving acceptance of them by all present is important in the nurturing of this instrument. Therefore, the appurtenances involved must be described and their presence explained in your own words of teach/learning, for you have the proper attitude for the required results." Tom had been a member of Don and Carla's Sunday night meditation group since 1973, along with his wife, Elaine. Elaine had kidney problems for the last few years of her life and eventually passed away in November of 1980. 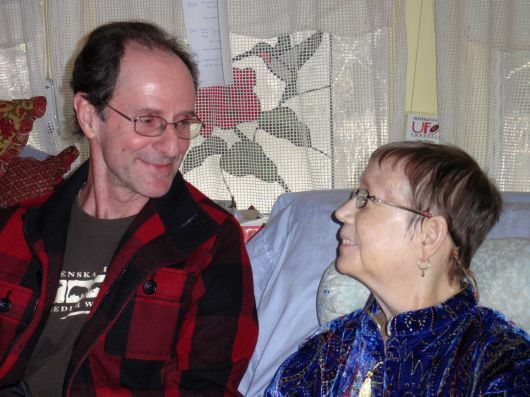 Tom and Elaine talked before her passing about how she would contact Tom after she had made her transition and let him know she was OK. On two occasions in that November Tom asked Carla to see if she could channel Elaine. "We have good contact with this instrument because of her recent experiences with trance. She is to be able to communicate our thoughts in your future. However, we advise care in disturbing the channel for a few moments and then the proper procedure for aiding an instrument who has, to some extent, the need of re-entering the mind/body/spirit complex which the instrument has chosen for the life experience of this time/space. Do you understand how to nurture this instrument?" Dana enjoyed the company of many of her cats visiting her and sleeping with her on her bed last night, but again it was early in the morning before she got her usual sleep. However, she awoke with a clarity of mind and energy of body that was fun to experience. She decided to use that energy to begin programming her new little bed computer to replace her old one that crashed last night. But the process became complicated as the new computer did not seem to want to function as it should. S0, she got out a mid-sized computer from her office that she hasn't used in some time and began to get it in good enough shape to be able to write letters and be workable until she can get a replacement for the new one that malfunctioned. I am very impressed with her ability to trouble-shoot computers and do whatever she needs to do on them. While Dana was busy with trouble-shooting I put the rest of the cat carriers together and spread them around the house so Dana's kitties can begin getting used to them. Then when it comes time to travel in another three weeks there should be a minimum of stress for the kitties as there will be a bed, litter box, food, and water in each carrier. After that work was done, Dana found the receipt for the new, malfunctioning computer, and I took it to Walmart and got a replacement that will, hopefully, work as it should. Incidentally, it might be helpful at this point if I share with everyone reading this blog a little more detail about how Dana and I are working towards her healing. Dana and I are truly hopeful that she will be able to be healed by the spiritual practices that she uses in her own life along with the diet, exercise, supplements, and acupuncture that she is employing in the practical sense. But we are also looking to higher principles of incarnational lessons that each of us is learning by partaking in the journey together. She is learning how to receive the love offerings of others, and I am learning how to give without expectation of return. We consider it an honor and a joy to be traveling this road together as the best of friends, whether or not healing or an actual move to Kentucky is the result of this journey. I am of the principle of Jesus the Christ. I greet you in the full consciousness of love and in its spirit. As one person looks upon another, creature looks at creature and spirit looks at spirit. In the eyes of some the creature is awake and the spirit quite asleep. In the eyes of others, the spirit has so far awakened that the creature needs no expression, for all has been sublimated to the transformation of spirit. In each glance, in each touch, and in each word with other entities, may your spirit speak mutely and creatively to those about you and may you rejoice to find the lively spirit when and where you will. Indeed, the spirit is in all. And it is well that all encouragement be given by you, that it may be awakened. To each creature which has the spirit underneath there are awakening and enlivening words and graceful gestures of love and compassion which can be made which do not preach in words but speak volumes to the spirit within others in a sense which goes far deeper than words. Thus, may your spirit speak, and thus may you aid in recreating and transforming all to spirit. We leave you in the lively, creative and transformational peace of the spirit of Christ. Amen.